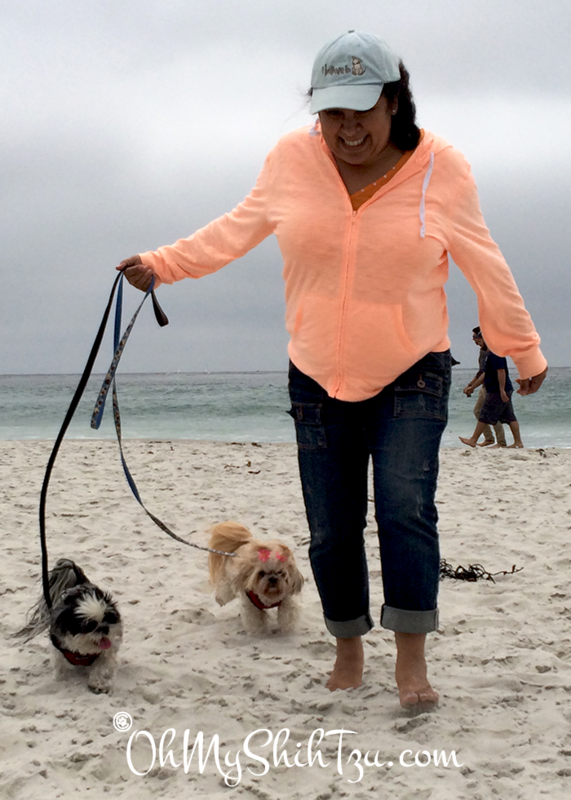 One of the greatest things about living in California is the ability to go to a great beach, which means Shih Tzus on the Beach! Mind you, normally for us it consists of at least a 2 1/2 hour road trip each way, but still relatively close enough for an easy day trip. The plan was to throw Katie & Riley in the car, leaving Trixie at home with grandma. But as I opened the door, little Trixie dashed out and made a straight beeline to the car. She put her little paws on the floor board letting me know she wanted in and looked up at me with those big brown eyes. Dang! There was no way I was going to leave her now, but it also worried me. You see, Trixie suffers from Canine Social Anxiety Disorder. She wants to go places, but is extremely terrified when we get there. It was so bad in the beginning after we rescued her that she would immediately potty when we were driving away. So now fast forward to today, we have gone on short little trips, to the bank, etc., but never anything long with her. I just don’t like to stress her out too much. Today was going to be a test I hadn’t planned on. But I know in my heart that I want her to experience life the way all dogs should, exploring and seeing the world! Well that short little drive turned into a drive from hell! The 2 1/2 hours turned into 4 because traffic was crazy! We eventually arrived in Carmel and headed straight to the beach! The girls just loved hanging out on the beach with us, watching the birds and listening to the waves crash against the sand. Riley and Katie have been to the beach before, but it was Trixies first time. I really thought that she would be scared of the waves, but she loved running on the beach! This day was a very eye-opening experience for me. Why? I suffer from Social Anxiety Disorder, yes I did joke about her having Canine SAD, but she did teach me a lot. That even when we have fears, sometimes it’s okay to face them head on, and experience life, but when you do, make sure you have someone there to help you along. Though at times I knew she was a little hesitant about being on the beach, but she would come and cuddle with me (she doesn’t do that often) and let me know that I was where she felt safe. I was her person. What a nice way to spend quality time with your pups! Gives them all the spaces to run around and dig through that sand. However, 2 and a half hour in the car is just a nightmare! 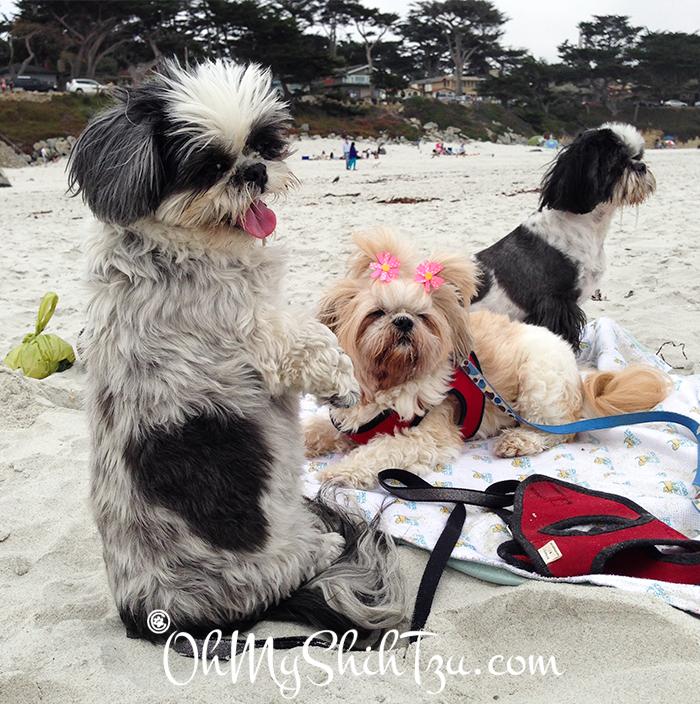 I couldn’t be able to have my pups go through such long drives because they get sick – Zoe (14 month old Shih Tzu) did one time, which luckily, I had a sick bag with me to use conveniently. However, my poodle terrier mix Cotton, likes to sleep during the entire trip. I also share your sentiments every time you see in their eyes that they want to go with you and you just couldn’t leave them behind. This is a very brave post; thank you for sharing it with us <3 I no longer suffer from anxiety; however, depression is still something that haunts me. I am amazed at how well Riley helps me with it – it's like I have someone to hold me accountable, to make me laugh, and drag me out of bed for a walk when all I want to do is stay in bed! I'm so glad you have a furry friend who helps with your symptoms. it is very hard at times… With my hubby with me though Riley was able to have a fun day “off the clock”… though next week we go back to school 🙂 I totally feel for you, it’s not fun. What a great story! I love how we can learn so much from our dogs. They have so much they can teach us, if we just open our eyes, minds and hearts. Looks like everyone had a great day at the beach! Looks like you all had a blast. Dex loves the beach and we head back to it in October. Oh my goodness, so adorable! <3 How do you deal with all that cuteness??! So glad you all finally got to enjoy the beach. 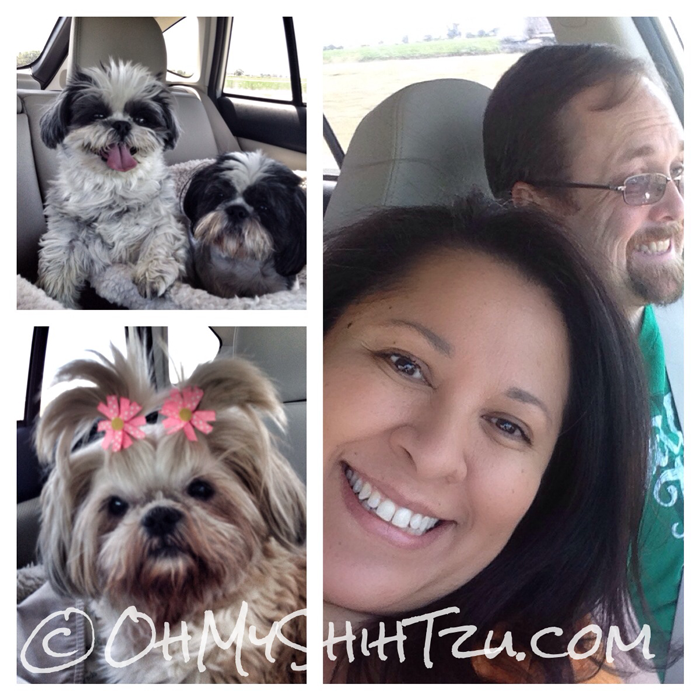 Today is a Shih Tzu day! So proud of Trixie – she seemed just fine on the beach in the video. I love the beach but I have to really travel long distances to get there. What a great adventure! (Well, except for the traffic! I hate traffic!) glad you all had a good time! We took Rita to the beach on Friday for the first time in ages and she had a great time too! It’s so awesome to spend quality time at the beach with your pooch. So glad Rita had a good time at the beach too!! Oh my they had a blast!!!! What FUN!! 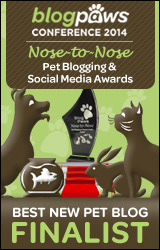 Caren Gittleman recently posted…Barking out the thank yous!!! Your little girls are absolutely adorable!!!! What a fun day at the beach you all had. We live within half an hour of the beach on the east coast, but it’s so crazy there in summer that we only take Daisy during the off season. We plan to go right after Labor Day in September, while the water’s still warm. Great photos! Daisy recently posted…Monday Mischief: Daisy’s Double Ears! Too cute!! We love the beach too…especially our Tzu Arty, who also is spending mischief Monday there! I just loved all the pics of Arty at the Beach!! He’s our man crush!! snoopy@snoopysdogblog recently posted…Monday Mischief – Woohoo!! That is a really long drive to the beach, but also typical from what we always hear about CA traffic. What a fun time. I miss living near the beach, but those days are behind us. Glad all pups got to go and had fun.